A bike can be more than just a fun source of exercise. For many people, bikes are trusted forms of transportation as well. With this in mind, a bike’s security should be a top priority for any bike owner. Figuring out the best lock setup for your bike isn’t always so easy, however. You’ll need more than a cable lock. A cable lock is typically the first accessory you buy with a bike, which makes sense: it’s often the most affordable option, and the easiest to use. A cable lock is better than no lock at all, but you’ll need more than that to keep your bike safe and secure. Cable locks can easily be severed with a pair of bolt cutters, leaving your bike vulnerable to thieves. A cable lock might be your first line of defense, but it shouldn’t be the last. Get a U-Lock that fits. In addition to your cable lock, you should also have a more robust U-Lock on hand. These U-shaped metal bars offer a secondary layer of security, but they still have their vulnerabilities. To keep thieves at bay, choose the smallest U-lock possible for your bike. This will make it much harder for thieves to break the lock. As an added benefit, smaller U-Locks are also lighter and easier to carry around. Look stronger than your neighbor. Presentation matters when it comes to bike security. More often than not, thieves will steal whichever bike appears easiest to get away with. If your bike looks more secure than the bike next to it, would-be thieves will be less inclined to waste time trying to break your locks. In this regard, a good sturdy lock can serve as a powerful theft deterrent. 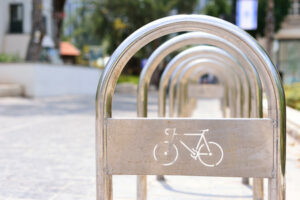 At Nantucket Bike Shop, we can help you select the best bike lock for your unique needs. Stop in or give us a call today to learn more!